Mormon Truth!! 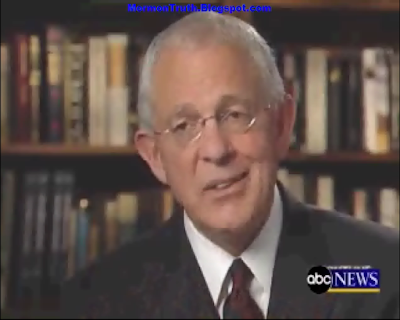 : Marlin K. Jensen, MORmON Seventy/bigot, Says The Church Won't Accept Gays, Even "If The Sun No Longer Shines!!" Now That's Love & Tolerance, Isn't it? Holy cupcakes! How INCREDIBLE to hear Jensen talk in such absolutes and with such a smug smile on his face. It's SHOCKING to actually hear it! I mean, I know they think it ... but the "we are always right" mentality is so persistent and chilling that it just astounds me!! How can he be soooo sure that there will not be a "divine revelation" in years to come (LOL), as there was when black members were finally allowed to hold the priesthood in 1978 (that just happened to coincide with civil rights groups putting pressure on the church to end the ban... hmmmmm?). Oh wait, I guess the "sun won't shine" if that happen. Geesh! I love what you said about Prophets, Seers and Revelators supposedly having such a direct connection, yet there is SOMETHING that they cannot explain or understand. Hmmmm... how very odd and curious. The link you included to the Monson "closet full of ghosts" is so interesting. Wow!! Isn't it just astounding that these same "leaders" have been so obsessed and worried about gays for decades & decades. Being so transfixed on one group of people and one specific subject has to make you wonder just WHY they are so scared. You know what they say about the most homophobic of the bunch ... they might be trying to suppress something personal that they can't come to grips with and are projecting it onto the issue at-large. I'm just saying. LOL! It breaks my heart to watch those men in the video who have gone through (and are going through) such anguish and heartbreak and trying to live their lives how they SHOULD be able to, while facing such bigotry and intolerance. How can such a "loving" organization be so full of hatred? I just find it so sad. My first roommate at BYU in the Helaman Halls dorms was kicked out of the school for being a lesbian. It was a horrific thing to witness. She was so distraught and so ostracized by so many; all the while, she was such an amazing person and all she wanted was for people to understand who she was and let her "be her" and live "her life" & not force her into fitting into some cookie cutter mold of "Mormon perfection." It was one of the turning points for me that really made me question the church. I think about her so often and wonder if she was able to find peace and acceptance and love, once she was away from the hate-filled walls of that campus and hopefully, away from the church too. I hope she was. Thank you again for the incredible information you provide, Samuel! I know it takes a lot of time and work. Please know that it DOES make a difference and is so appreciated!! Just writing for a little advice. My husband and I officially had our names removed from church records last year, as well as our children's names (even though they were never baptized and it's bs that they were ever considered members in the first place - LOL). We played that whole cat & mouse game where they pretended they didn't get our letter - so we re-sent it, registered this time for proof - had their lame series of letters arrive. The bishop came to our house three times to be sure we "knew the eternal consequences" blah, blah, blah and FINALLY after months & months of the ridiculousness, we got our letters that we were no longer members and our names were removed. Hooray! Well, despite being assured that the church would now leave us alone; low & behold, two missionaries show up tonight saying that "someone" submitted our name on their website, saying that we would like a visit from them. Five minutes debating with my husband and they were ready to hightail it out of the porch way, but still... this is SO ANNOYING. Won't they EVER leave us alone? Do you or any of your readers have advice for how to stop them once & for all? I was taught in LDS seminary that Homosexuallity was the worst sin you could commit next ot murder. LDS teaches always taught that being gay was choice, A choice of sin. Now I know too many gay freinds and none of them would have chosen to be gay, they would be normal if they had a choice. I thought you might like to do a blog about this misleading ad in the NY Times. It's almost laughable! I opened The New York Times last Friday to find a full-page ad that is the ultimate demonstration of what our community is going to face moving forward. The Becket Fund for Religious Liberty purchased the ad to blame supporters of equality for "violence and intimidation" directed towards the Mormon Church and its members in the aftermath of Prop. 8's passage. We all know these claims are, at the very least, exaggerations, and at worst, outright falsehoods. We're going to see this as we work toward marriage equality and fight to enact federal hate crimes legislation: the other side can only win by telling lies about us. It's time for us to stand up for the truth. Join members of the HRC Religion Council in forcefully responding to this despicable ad. HRC has gathered the voices of clergy members from all faiths to respond to the false suggestion that there is an organized attempt to foment mob intimidation and violence toward the Church of Jesus Christ of Latter-day Saints in response to their support for Prop. 8. When did the LDS Church become the victim? This is the same church that conducted a national broadcast to every temple, calling on members to organize and write checks to the Prop. 8 campaign. The same church whose members donated more than half of the $40 million behind Prop. 8, even though California Mormons represent just 2 percent of the state's population. The same church that continues to spend exorbitant sums to mislead the public and attempt to transform its image. Yes, it's the same church. Anti-LGBT groups have spread mistruths to defeat us and it's what they are going to keep doing. And I think we've all had enough of it. Send your message to The New York Times – we'll also forward a copy to the Becket Fund to make sure they know we're fighting back against their lies. We need look no further than the key victories we achieved during the elections to know that when we band together, we can win.